product to lawns growing around or near trees. 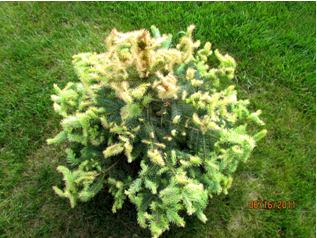 Which tree and shrub species have shown symptoms following Imprelis® application? DuPont™ advises to not apply Imprelis® where Norway spruce (Picea abies) and eastern white pine (Pinus strobus) are located, however, in June 2011 reports from across the Eastern and Midwestern U.S. indicated other conifers, as well as some deciduous species, are showing similar injury that may be due to Imprelis® applications. Other species that have shown injury include white spruce (Picea glauca), Black Hills spruce (Picea glauca ʻDensataʼ), Colorado blue spruce (Picea pungens), northern white-cedar or arborvitae (Thuja occidentalis), dawn redwood (Metasequoia glyptostroboides), firs (Abies spp. ), yews (Taxus spp.) and several other woody ornamental species. 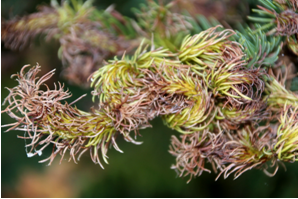 What symptoms have been observed on trees and shrubs following Imprelis® application? symptoms. Drought injury, in particular the browning and death of new shoots, can also resemble herbicide damage. This can occur on newly planted trees when improperly watered, or on established trees during a severe drought. What can I do to help my trees and shrubs recover? Trees usually recover from slight herbicide injury. Irrigating the trees during a drought as well as all newly planted material is imperative to help alleviate moisture stress. Use of soaker hose around the bases of trees is recommended, however, avoid flooding the surrounding soil with water as this may increase the risk of bringing additional herbicide into the soil solution where it could be taken up by tree roots. Fertilization of trees during times of pest and disease activity, drought, or herbicide injury will generally only exacerbate the problem; promoting new growth which can be more easily damaged. For lightly damaged plants, prune out the dead branch tips. If branch dieback occurs, delay pruning of entire branches until the extent of damage and potential development of new buds for next year can be better evaluated. For many trees, the next yearʼs vegetative and flowering buds are set in midsummer and mature during late summer and fall. Further decline of branches may continue into the next year and long-term severity of the damage is unknown. Complete tree removal is not necessarily recommended at this time. Avoid planting new evergreens and other trees, shrubs, and perennials into soil that was previously treated with Imprelis® during the same season. Do not compost or use as mulch any grass clippings from lawns treated with Imprelis®. Avoid planting evergreens after mid-October, as there is inadequate time to establish new roots before the ground freezes. 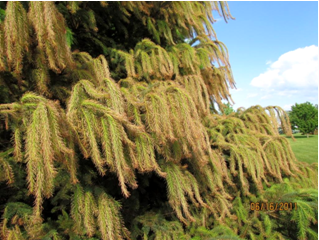 Many late fall planted evergreens may show significant winter injury the following spring. Most deciduous trees can be planted in autumn without injury, though some species do not do well when dug from the field and planted in fall (oaks, birches, magnolias, hickories, etc.). Those species should be dug in spring and planted as soon as possible. Where can I get more information in Wisconsin? Diagnostic Clinic at UW-Madison (http://pddc.wisc.edu) or the Turfgrass Diagnostic Lab (http://www.tdl.wisc.edu).